French Foreign Minister says his country would recognize a Palestinian state if efforts to resume peace talks fail. French Foreign Minister Laurent Fabius declared on Friday that his country would recognize a Palestinian state if its efforts in coming weeks to try to break the deadlock between Israelis and Palestinians fail. 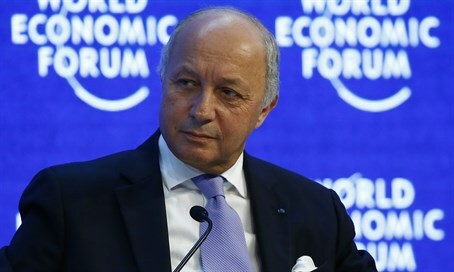 “France will engage in the coming weeks in the preparation of an international conference bringing together the parties and their main partners, American, European, Arab, notably to preserve and make happen the solution of two states,” Fabius said, according to Reuters. He added that as a permanent member of the UN Security Council, France had a responsibility to try to keep up efforts to find a two-state solution. The comments come amid repeated efforts by France to bring Israel and the Palestinian Authority (PA) back to the negotiating table. France last year introduced an initiative for a UN Security Council resolution that would force Israel into an 18-month negotiation period with the PA. Earlier this week it was reported that France is attempting to bring together Prime Minister Binyamin Netanyahu and PA chairman Mahmoud Abbas for a meeting, which would take place as part of a regional conference to be held in Paris. Peace talks between Israel and the PA have been stalled since 2014, when Abbas unilaterally applied to join international institutions in breach of the conditions of the talks. Should France recognize “Palestine” it would be joining a host of European countries which have already made similar moves. Britain was the first country to vote to recognize “Palestine”. After Britain, Sweden announced it officially recognized the state of "Palestine". In December of 2014, Portugal's parliament adopted a resolution calling on the government to recognize a Palestinian state, though Portugal's Foreign Minister Rui Machete said after the vote the government "will choose the moment best suited" to recognize the Palestinian state. French Socialist lawmakers were in late 2014 preparing to submit a motion to parliament to recognize “Palestine” as well. At the time, Fabius said his country would not hold a vote to recognize the PA as the "state of Palestine".